Nilgiri Chicken Korma: Nilgiri chicken korma hails from the Nilgiri Hills in India’s Tamil Nadu state. The key to Nilgiri chicken korma is coconut, mint and coriander which lends it a greenish-brown shade and infuses it with a mild herby flavour and infuses the korma with a mild sweet herby flavour. The perfect mix of the Indian spices makes this dish extremely delicious. Dry roast the ingredients under “For Dry Roast”, on medium heat for 5 minutes. Heat the 2 tablespoon oil in a frying pan over medium heat. Roast the ingredients under “For Roast” in oil, foe about 4-5 minutes. Make a paste of dry roasted ingredients and roasted ingredients, adding a few tablespoons of water. Heat the oil in a heavy bottomed pan, on medium heat. Sauté for a few seconds, till the curry leaves become crisp. Fry till the onions become transparent. Fry for few seconds or till a sweet aroma of the roasted ginger-garlic wafts from the pan. Add in the red chilli powder, turmeric powder and salt. Fry the mixture for 4-5 minutes. Cook over medium heat for 7-8 minutes. Add in the lemon juice and the chicken pieces. Cook without lid for 5-6 minutes. Add in about 3 cups of water. Cook with lid covered, on simmer till the chicken is tender and the gravy thicken. Nilgiri chicken korma is ready to be served. Garnish nilgiri chicken korma with chopped coriander leaves. Serve hot nilgiri chicken korma with pulao, biryani, coconut rice or rotis. 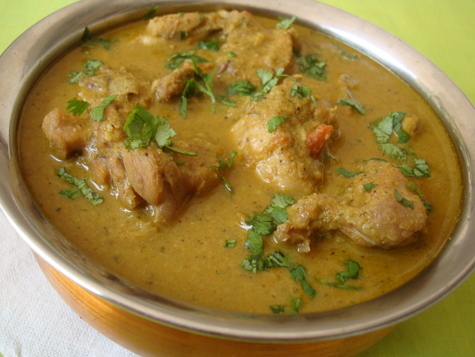 If you have any queries regarding the Nilgiri Chicken Korma recipe, please leave a comment.